Today is National Lighthouse Day. And as I do this time every year, I like to reflect on the lighthouse experiences I’ve had thus far. And scroll through my library of lighthouse photos and videos I’ve taken. Tonight, I’ve been revisiting pictures I took on September 19, 2015, during a boat cruise of 10 lighthouses along the Chesapeake in Maryland. As I’ve looked through these pictures, I was reminded of one timeless truth: lighthouses come in a variety of shapes and sizes. But they’ve all served a common purpose. It is a lesson that we as humans would do well to remember. Annually, National Lighthouse Day is celebrated on August 7 in honor of United States lighthouses. In honor of National Lighthouse Day, take a journey back with me to some of the lighthouses I have visted over the course of almost three years. I will always have a special affinity for Absecon Lighthouse in Atlantic City, New Jersey. It is the first lighthouse I ever visited and climbed. Absecon is the tallest lighthouse in the Garden State, and the third tallest in the United States. I first visited there in September 2013. 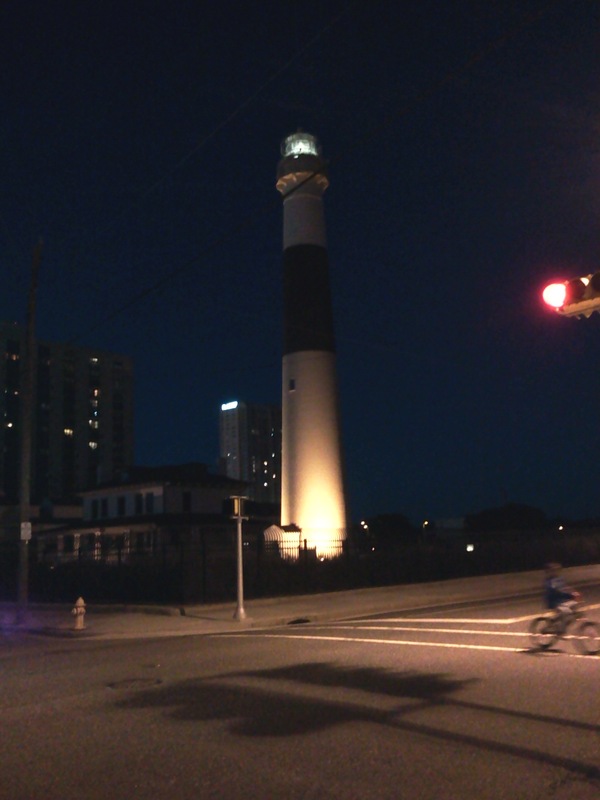 Above: My nighttime view of Absecon Lighthouse on Septmeber 19, 2013. 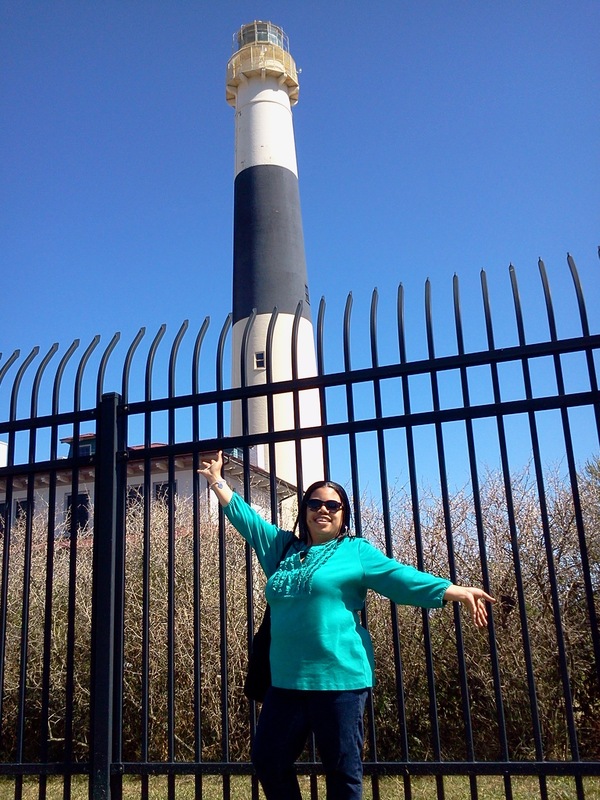 Above: September 20, 2013 at Absecon Lighthouse- I could barely contain my excitement as I spent my birthday climbing a lighthouse for the first time. Since 2013, I have made it a point to try to visit Absecon Lighthouse once a year. 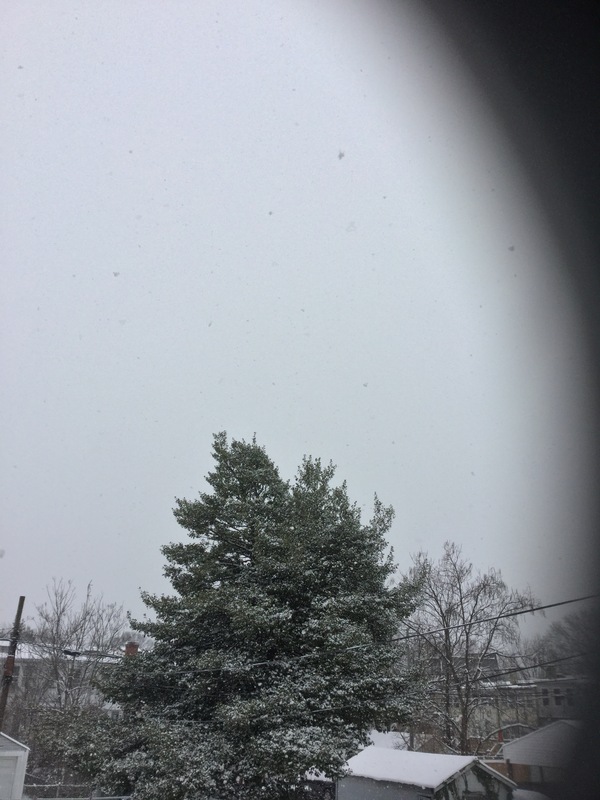 In 2014, I returned to Absecon to celebrate another birthday there. 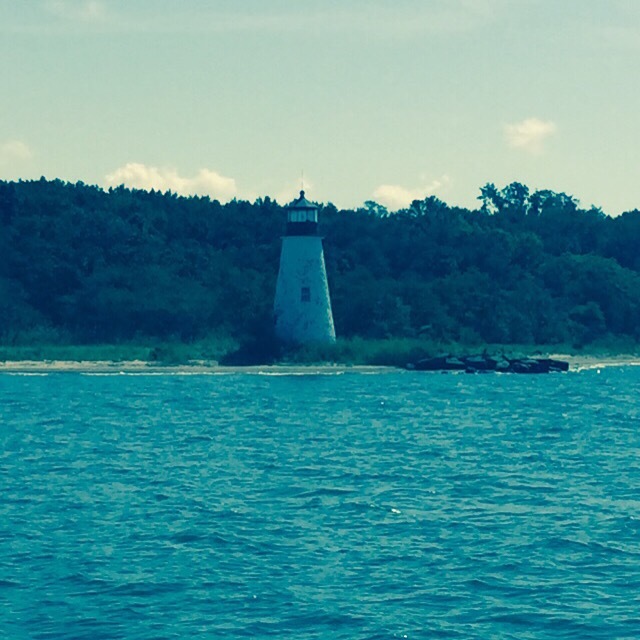 On September 22, 2014 I visted Drum Point Lighthouse in Solomon, Maryland. Drum Point is one of the few remaining screw pile, cottage style lighthouses in Maryland. Above: Listening to the tour guide give a talk about Drum Point Lighthouse, from the room that houses the fourth-order fresnel lens. What I love most about Drum Point Lighthouse, is the sense it gives you of how families actually lived there. Inside you will find replicas of living quarters, including bedrooms, a kitchen and dining room. 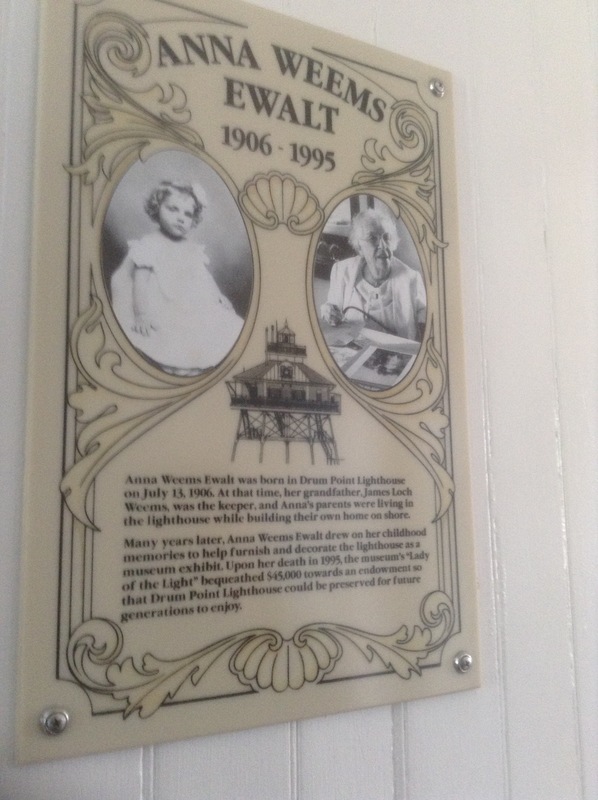 On one of the walls is a tribute to Anna Weems Ewalt, who was born inside Drum Point on July 13, 1906. In 2015, I wanted to experience lighthouses in a way I had not before. 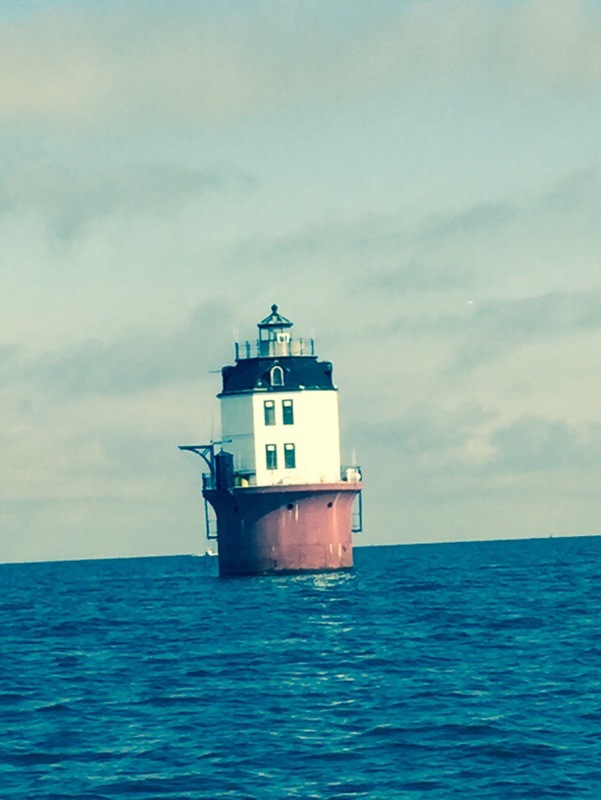 On Septmeber 19, I boarded the MV Sharps Island boat for a tour of 10 lighthouses along the Chesapeake Bay. As the boat approached each lighthouse, CAPT Mike would stop the boat long enough to talk about the lighthouse and allow us time to take pictures. One of my favorite lighthouses that day, was Thomas Point Lighthouse, our second stop on the tour. Other personal favorites for me that day, were the Baltimore Lighthouse (currently undergoing renovation), and the Pooles Island Lighthouse. The day after my boat tour, I visted the Cove Point Lighthouse in Lusby, Maryland. Cove Point is stil an active aide to navigation. As such, you can stand at the base of the lighouse and look up the spiral staircase. But you cannot go to the top of the lighthouse. Each lighthouse experience is unique. You come away with different information and lessons learned, and thankful for each opportunity to experience lighthouses in a different way. I am looking forward to new lighthouse experiences in the weeks ahead. Today’s post is all about the fresnel lens. The Fresnel Lens was developed by French physicist Augustin Fresnel. This was my view of the first-order fresnel lens at Absecon lighthouse in Atlantic City, New Jersey on September 20, 2014. And this was my capture of the fourth-order fresnel lens inside the tower room at Drum Point lighthouse in Solomons, Maryland on September 22, 2014. Finally, from inside the museum beside Drum Point lighthouse, a section dedicated to lighthouses and the fresnel lens. Because I had only been to land-based lighthouses, I was determined that 2015 would be the year I would experience lighthouses in a different way. 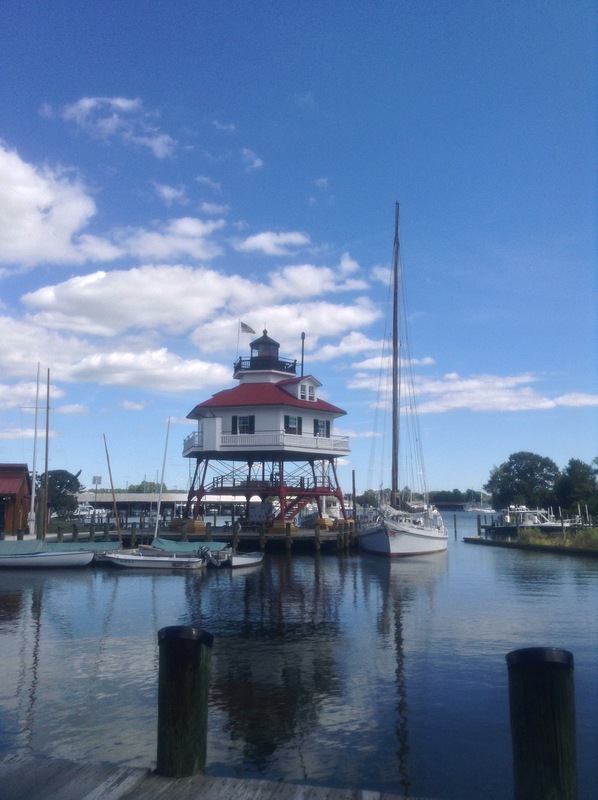 On September 19, I embarked on a day-long cruise of ten lighthouses along the Chesapeake in Maryland. Shortly after 8:00 AM, I arrived at the Knapp’s Narrows Marina & Inn in Tilighman, Maryland and boarded the Sharps Island Boat; the M/V Sharps Island. At the helm was CAPT Mike, who has had the boat since 2002. After a few minutes of explaining boat safety and what I and the other passengers could expect on this lighthouse tour, the adventure began! The first stop of the morning was the Sharps Island Lighthouse. CAPT Mike explained that as we approached each lighthouse, the boat would be slowed down in order for us to take pictures. As we arrived upon Sharps Island Lighthouse, CAPT Mike made sure to point out the masonry inside the lighthouse. Next, it was on to Thomas Point Lighthouse. Thomas Point is the last screw pile lighthouse along the Chesapeake, that is still in its original location. 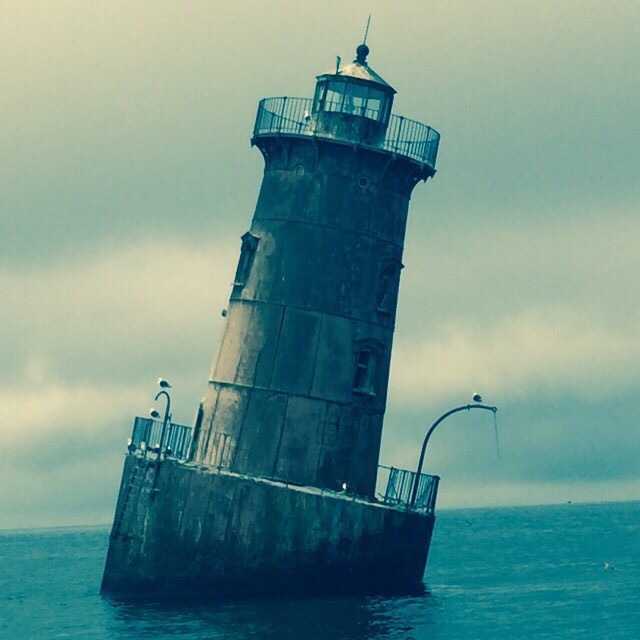 Stopping by Thomas Point Lighthouse on September 19, 2015 on the M/V Sharps Island. Our third stop of the morning was Sandy Point Lighthouse, which is now privately owned and being repaired. Baltimore Lighthouse was our fourth stop of the day. 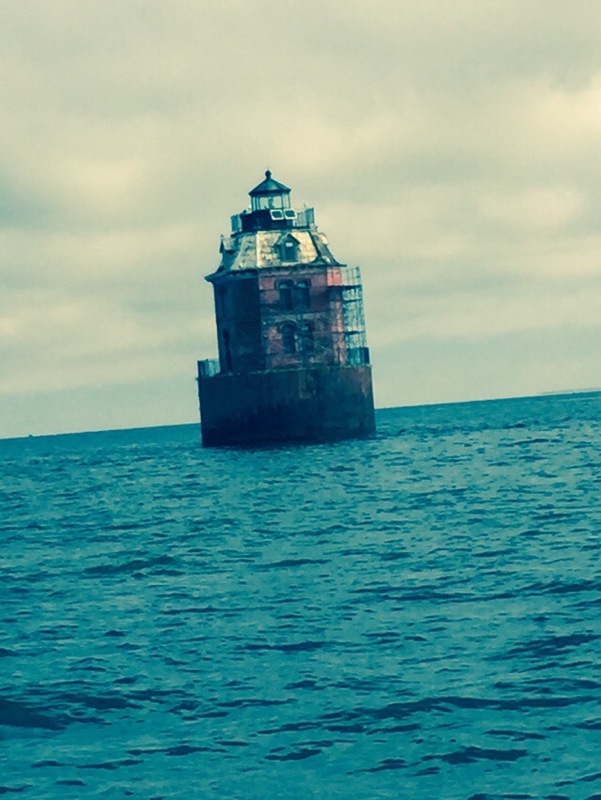 It was the last lighthouse along the Chesapeake to be built, and is privately owned. Next on the agenda was a stop at Tolchester Beach in Chestertown, Maryland for lunch at the Channel Inn Restaurant. This also allowed for the opportunity to refuel the boat. After lunch, we saw the remaining lighthouses that were part of the itinerary. Craighill Lower Range Light- Rear, North Point Range Lights, Craighhill Channel Upper Range Light- Front were our next stops. Bloody Point Lighthouse was the final lighthouse on the tour. CAPT Mike noted that it was the scene of a terrible fire in 1960. The approach to Bloody Point Lighthouse! 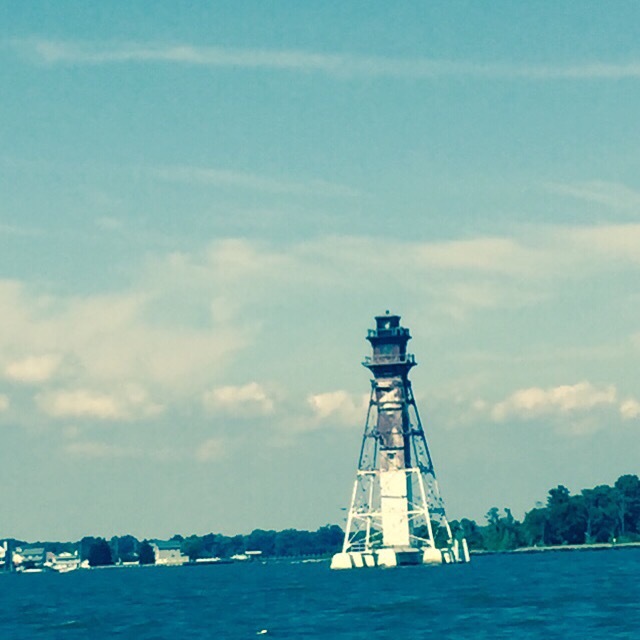 We returned to the Knapp’s Narrows Marina just shortly after 5:00 PM, after a beautiful, relaxed day spent on the waters of the Chesapeake, looking at 10 lighthouses, all different in shape, size, and the stories they held, from the Sharps Island boat. To learn more about various tours of the Chesapeake lighthouses, visit: http://www.chesapeakelights.com/. The next morning, September 20, I capped my birthday weekend’s lighthouse festivities with a visit to Cove Point Lighthouse in Lusby, Maryland. Cove Point is Maryland’s oldest, continuously operating lighthouse. Because it is still an active aid-to-navigation, those visiting the lighthouse are not permitted to go to the very top of the lighthouse to the tower room. 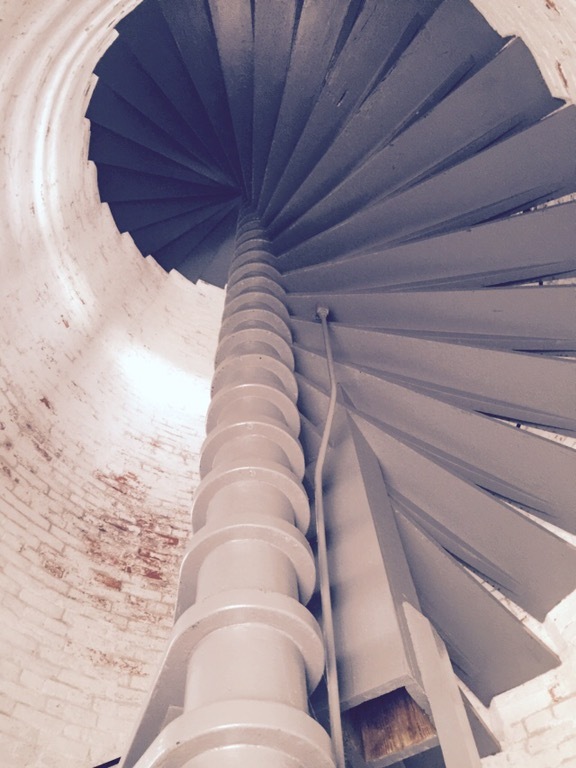 During my visit, it was explained that we could stand at the base inside the lighthouse and look up at the spiral staircase. 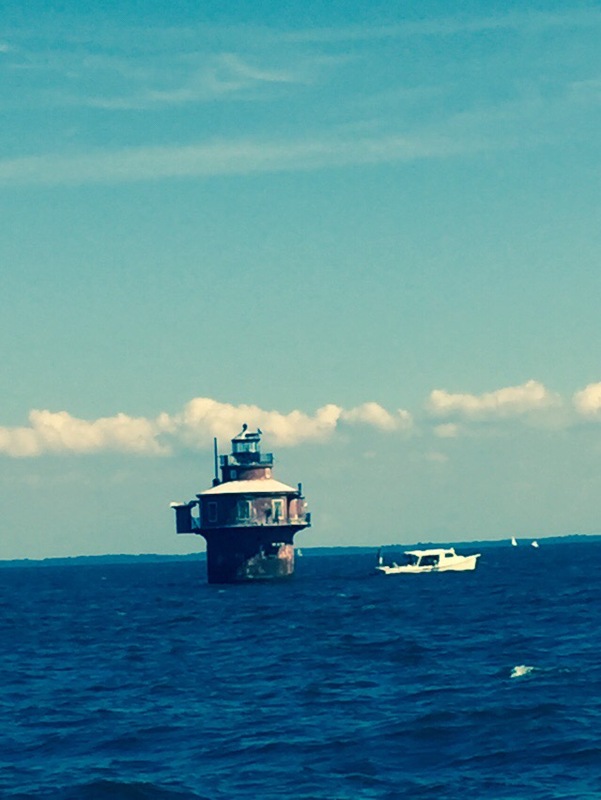 Cove Point Lighthouse as seen on September 20, 2015. 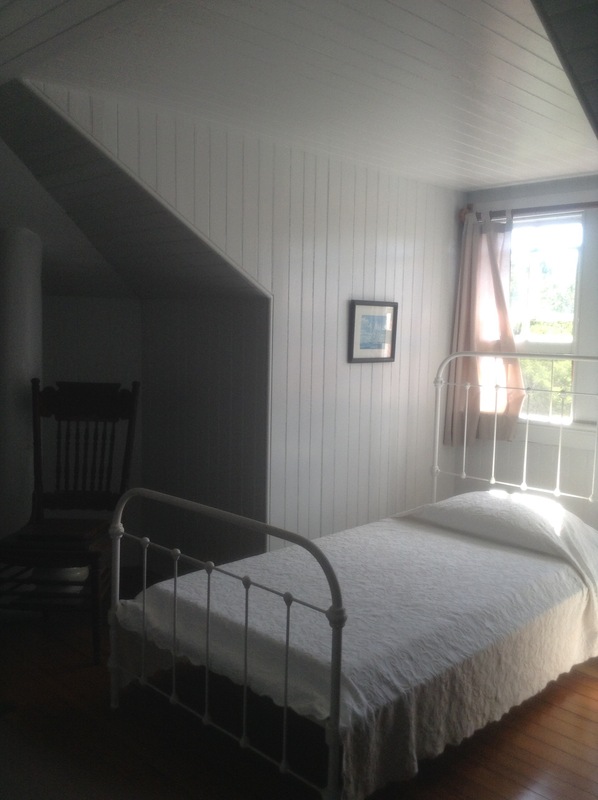 You can also arrange for overnight stays at Cove Point Lighthouse. The morning of my tour of Cove Point, we could not go inside the keeper’s house because there was a family who had rented the keeper’s house for an overnight stay. It was an extremely windy day at Cove Point Lighthouse. Although I was visiting Cove Point Lighthouse independently, it was exciting to see others who were there as part of Maryland’s Lighthouse Challenge Weekend, during which participants are encouraged to visit as many lighthouses in Maryland as possible, during the challenge weekend. Inside the Visitor’s Center on the grounds of Cove Point, many of those participating in the Maryland Lighthouse Challenge Weekend were getting their lighthouse passport books stamped, marking their visit to Cove Point. To learn more about Cove Point Lighthouse, visit: http://www.calvertmarinemuseum.com/200/Cove-Point-Lighthouse. 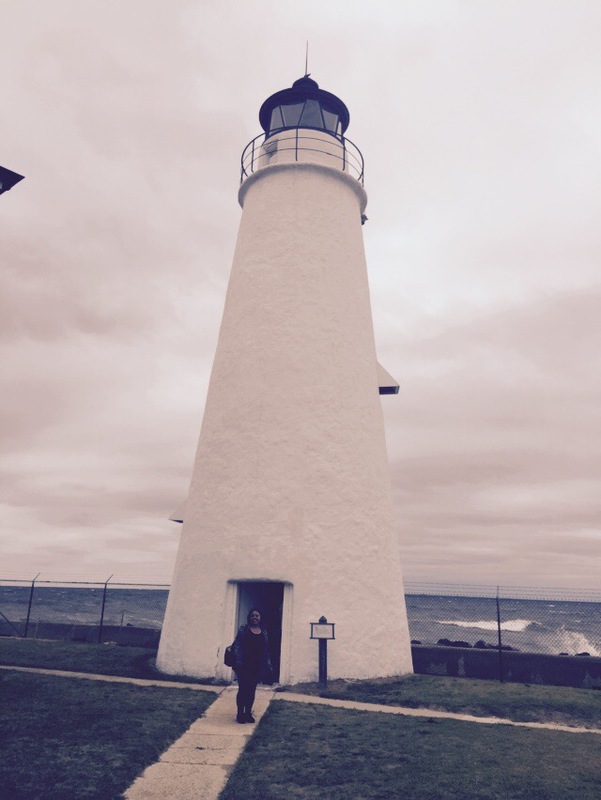 As 2015 winds down and I reflect on my year, I am thankful for the opportunity to have experienced lighthouses in a different way by participating in a boat tour of 10 off-shore lighthouses along the Chesapeake, and also continuing my visit to land-based lighthouses such as Cove Point. I am enriched by each lighthouse experience I have, and always come away eager for the next! My second article published in Lighthouse Digest magazine chronicled my second visit to Absecon Lighthouse in Atlantic City, New Jersey, and my first visit to Drum Point Lighthouse in Solomons, Maryland.